"STILL NO SNOW HERE IN THE NORTHERN FOREST!" The photo, taken this week, shows a heavy frost one morning and that was as close as we got too snow! However, it is snowing now as I write this blog and the forecast, from Environment Canada, is for some snow every day this week. I hope they are correct. The weather kept us running short miles; however, we finished the week with only one stop runs. The dogs did great! We were able to get in 4 days of training as compared to the 3 day training week experienced over the last two weeks. The dogs showed an enthusiastic attitude each run including the training on the third day in a row. The puppies are really growing and getting more hyper with the change to the higher performance food. You can see them being watered this morning on a new post on YouTube. "BEAUTIFUL SPRING LIKE WEATHER IN THE NORTHERN FOREST!" Yes, the weather has been more Spring like rather than the normal weather for November. 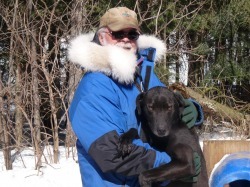 These unseasonably warm days and below freezing nights is great if your not a Dog Musher! The above photo shows ice forming on the lake despite the warm temperatures during the day. The challenges facing the training program is that below freezing temperatures over night cause the ground to freeze making it unsuitable for running the dogs early in the morning when the temperatures are cooler. The frozen trails are too hard and can cause the possibility of shoulder injuries for the dogs. We were able to get in 3 runs last week later in the day when the frost was out of the ground and thus softening the trail. The warm temperatures caused a reschedule of the training and reverting to back to 4.5 mile runs. In order to make a positive of the schedule changes, the training intervals were changed to 4 minute runs and 1 minute rest. The dogs are in great spirits and showing high attitude despite the changes. Currently (11 pm ), the temperature is 8C and very humid and the next week weather is forecasting more unseasonable temperatures. Patiently, we await colder temperatures and some needed snow.